Serendipity: How the "Vogue" word Became "Vague"
When Horace Walpole committed the word serendipity to paper for the first time exactly 250 years ago, had he pondered the destiny of his neologism he could not have imagined its eventual popularity, or, for that matter, its consequent debasement. For while serendipity experienced a kinder fate than other Walpolean creations such as triptology - coined after observing Samuel Johnson's "habit of repeating things thrice" - it has suffered grievous corruption of meaning. That the journeying of this word warrants comprehensive examination is demonstrated by the sociologist Robert K. Merton and the historian Elinor Barber in The Travels and Adventures of Serendipity: A Study in Sociological Semantics and the Sociology of Science. The book has a curious history. Completed in 1958 it was intentionally left unpublished, serving as a preparation for Merton's seminal work, On the Shoulders of Giants (1965). Four decades later the authors agreed to an Italian translation - published in 2002 after Barber's death - and now, a year after Merton's death, sees the appearance of the English version. A Magnificent Fairy Tale Begins . . .
"In ancient times there existed in the country of Serendippo, in the Far East, a great and powerful king by the name of Giaffer. He had three sons who were very dear to him. And being a good father and very concerned about their education, he decided that he had to leave them endowed not only with great power, but also with all kinds of virtues of which princes are particularly in need." 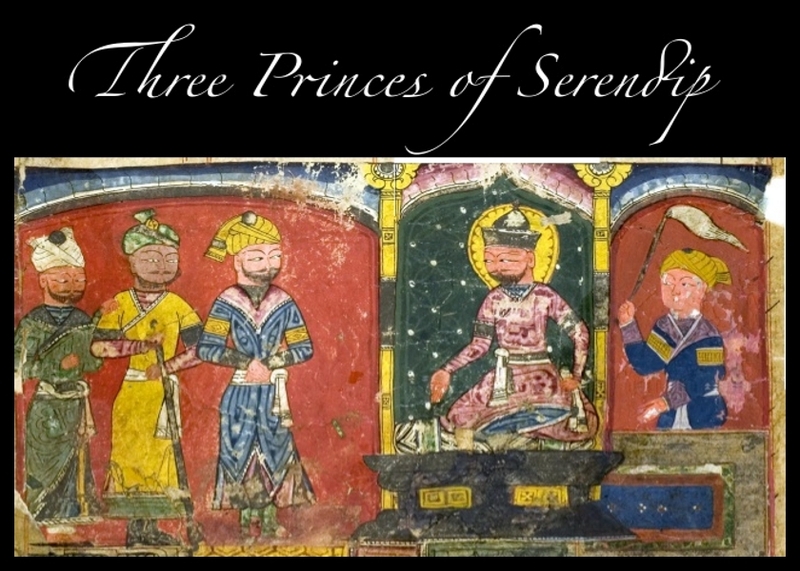 So begins the fascinating story of The Three Princes of Serendip. In order to provide the best tutors for his sons, the king travels throughout the island until he finds a number of scholars, each specialized in a different field, "And to them he entrusted the training of his sons, with the understanding that the best they could do for him was to teach them in such a way that they could be immediately recognized as his very own." As the three princes are endowed with great intelligence, they soon become highly trained in the arts and sciences. However, when the tutors inform the king of his sons' achievements, he is sceptical. So he summons his eldest son and announces that he wishes to retire to a monastery and that his son should succeed him as ruler. The eldest son politely refuses, insisting that his father is wiser and should reign until his death. The two younger sons also refuse when commanded in a similar manner. Although the king is astonished by the wisdom displayed by his sons, he decides to send them on a prolonged journey so that they can acquire empirical experience. He summons his sons and, giving the impression of being angry and disappointed because they have all disobeyed him, banishes them from Serendip. "Thus they started their peregrination and moved out of his kingdom until they reached the kingdom of a great and powerful emperor, whose name was Beramo." Misfortune befalls the princes when a camel driver stops them on the road and asks them if they have seen one of his camels. Although they have not, they have noticed signs that suggest a camel has passed along the road. Ever ready to dazzle with their wit and sagacity, the princes mystify the camel driver by asking him if the lost camel is blind in one eye, missing a tooth and lame. The camel driver, impressed by the accuracy of the description, immediately hurries off in pursuit of the animal. After a fruitless search, and feeling deceived, he returns to the princes, who reassure him by supplying further information. The camel, they say, carried a load of butter on one side and honey on the other, and was ridden by a pregnant woman. Concluding that the princes have stolen the camel, the driver has them imprisoned. It is only after the driver's neighbour finds the camel that they are released. The princes are brought before Emperor Beramo, who asks them how they could give such an accurate description of a camel they had never seen. It is clear from the princes' reply that they had brilliantly interpreted the scant evidence observed along the road. As the grass had been eaten on one side of the road where it was less verdant, the princes deduced that the camel was blind to the other side. Because there were lumps of chewed grass on the road the size of a camel's tooth, presumably they had fallen through the gap left by a missing tooth. The tracks showed the prints of only three feet, the fourth being dragged, indicating that the animal was lame. That butter was carried on one side of the camel and honey on the other was clear because ants had been attracted to melted butter on one side of the road and flies to spilled honey on the other. The deduction regarding the pregnant rider is more complicated than the rest and is somewhat lewd, so I shall let the princes tell it themselves: "I guessed that the camel must have carried a woman," said the second brother, "because I had noticed that near the tracks where the animal had knelt down the imprint of a foot was visible. Because some urine was near by, I wet my fingers (in it) and as a reaction to its odour I felt a sort of carnal concupiscence, which convinced me that the imprint was of a woman's foot." "I guessed that the same woman must have been pregnant," said the third, "because I had noticed nearby handprints which were indicative that the woman, being pregnant, had helped herself up with her hands while urinating." Although Walpole mistakenly believed it to concern a mule, it is of course this camel episode that he latched onto as an example of serendipity, inadequate though it may be.